Featuring the foods and customs of two families whose roots are planted in the Tuscan hills, this comprehensive presentation of the cuisine of Northern Italy includes nearly three hundred kitchen-tested recipes. Covering every aspect of the Tuscan kitchen from appetizers through dessert, the recipes feature breads; fish and game dishes; meat, lamb, and veal offerings; omelets; pastas (from stuffed varieties to polenta); poultry; rice; salads; snacks; sauces; soups; and vegetables. An entire chapter focusing on pork preparations includes some of the books showcase recipes, such as porchetta, and outstanding salami, prosciutto, and blood pudding. Far beyond simple recipes, the book includes an examination of the differences in regional cooking in Italy and how these differences have been adapted in America. Using Tuscan proverbs and traditions as a base, the authors delve deep into Tuscan holidays and the people’s relationship to their land and the climate. 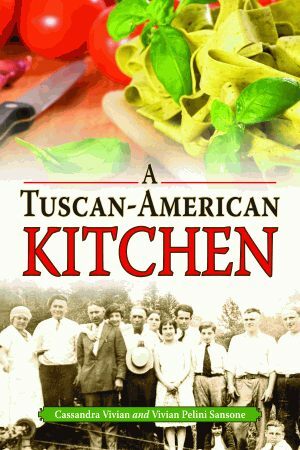 Five essays accompanying the recipes further illuminate the routines and rituals throughout the Tuscan year, immigrant stories, how to shop Italian, and country-style cooking. Useful illustrations, ranging from step-by-step instructions for stuffing an artichoke and making cannelloni to making homemade wine and identifying dozens of different types of pasta, add a further dimension of experience to the volume. A third-generation Italian American, Cassandra Vivian is a retired historian, columnist, public relations consultant, entrepreneur, and English instructor. The author of nearly twenty books, Vivian has received awards from the Pennsylvania Council on the Arts, the NAACP, the Pennsylvania House of Representatives, and Outstanding Young Women of America. She lives in Mt. Pleasant, Pennsylvania. Vivian Pelini Sansone is the daughter of Italian immigrants. Her mother instilled in her a love of cooking, and Sansone has always enjoyed perfecting new recipes and old standbys, much to the joy of her family. Now retired, she worked for Bell Telephone Company for more than thirty years. She lives in New Castle, Pennsylvania. A great cooking guide to "Eat-aly"
"Some of the best recipes from the best of [the new Italian cookbooks]."